If you have unwanted pests or bugs in your garden then naturally you would want to get rid of them. First consider that all insects have a role to play in nature and the environment, and extermination may not always be the best option, such as with bees and wasps that pollinate flowers and crops, which is essential for the production of food. Some may think it wise to purchase chemical products that are manufactured to keep bugs out of your garden. It should be said, however, that such chemical products can actually cause more harm than good, and can sink deep into the ground and possibly contaminate the tap water running into your home when used consistently. Thankfully there are numerous organic methods of pest control to keep bugs out of garden safely and effectively. 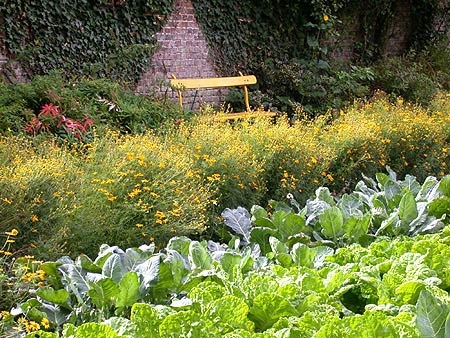 If the pests within your garden are causing such a problem that extermination seams to be the only solution, you do not need to use harsh chemicals. Simply spray some soap over the bugs you wish to exterminate. Soap contains fatty acids naturally within it, which work to dissolve the protective shell that most insects have and eventually lead to their demise. Add around one teaspoon of natural dish soap, or you can use liquid castile soap alternatively, into a quart-sized spray bottle and fill the bottle with water. Shake the bottle to mix the water and the soap, and then spray the resulting solution onto the invading bugs. This is effective at exterminating various pests, including mites, aphids, thrips, and scale. Extra exterminating power can be added to the method detailed above by including hot pepper and garlic. Both of these natural ingredients can work to repel any further infestation by making the flavor and aroma of the plants unfavorable to bugs/pests. 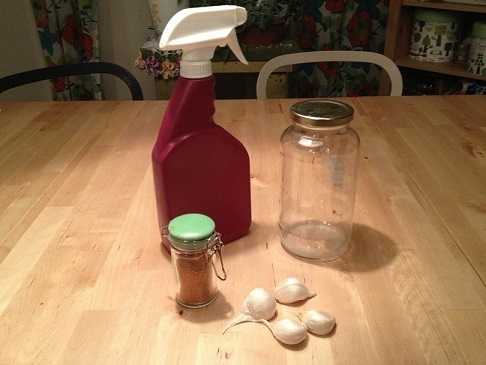 What you need: Six cloves of garlic (or one small bulb), one small hot pepper (or one teaspoon of hot sauce), and the natural dish soap/liquid castile soap. First, dice the hot pepper and the garlic and then place them into a blender. Add around one cup of water and blend until a smooth texture appears. Once you have allowed the mixture to steep for around an hour or so, strain it so as to remove any solid bit from the solution. If these small, solid bits are not removed then they may clog the dispenser on the spray bottle. The resulting mixture can then be added to the spray bottle along with the soap, then fill the bottle with water, mix, and spray on unwanted pests. Horticultural oil, a refined version of paraffinic oil, once mixed with water within a spray bottle, it can be sprayed onto plants in your garden. Horticultural oil works by essentially suffocating the insects and their eggs when it is coated upon them. And you can use it in any seasons, either dormant or growing, which makes it a great option in terms of how to keep bugs out of garden. Turmeric has numerous benefits for an individual when consumed, and it can also work to repel pests when sprinkled in the garden. To do this, simply acquire some powdered turmeric and sprinkle it around the base of your plants as well as on the leaves. You can also steep fresh turmeric with water and apply the mixture with a spray bottle. If you find that your garden is infested with slimy slugs and snails, then eggshells may work as a good repellent. Simply crush up a load of used egg shells and sprinkle them in the soil in your garden. 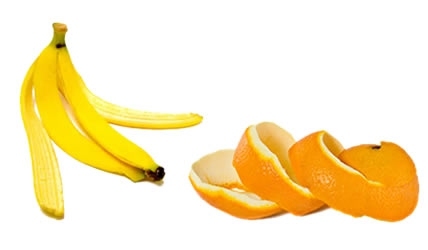 When it comes to how to keep bugs out of garden, some fruit peels, such as banana and orange peels may prove helpful. With banana peels, first cut them up then bury the pieces around your garden around two-three inches deep in the soil, wherever aphids or ants have infested. For orange peels, you can either boil them and make a spray from the resulting solution, or simply spread them on top of infested soil. 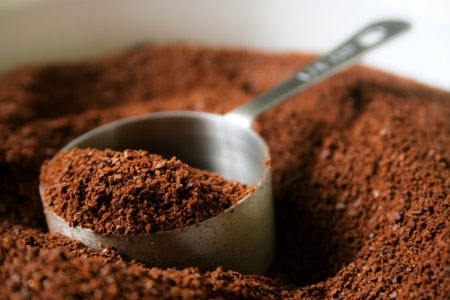 Spreading coffee grounds around in your garden can have numerous beneficial effects, including warding off unwanted pests. Numerous creatures are repelled by coffee grounds, including slugs, cats, and sometimes even deer. This method will work with most coffee grounds, although instant coffee granules may not be effective. This mixture can work to repel pests like snails, who are troubled by the microscopically sharp mixture. It also works to absorb oils and fats from insects shells, causing them to rapidly dehydrate. Basil – When planted with tomatoes, basil is known to improve their flavor and overall production. They can also be beneficial when planted with peppers, helping to ward off mosquitos. Borage – Borage can help numerous different plants when planted close by. For tomatoes, it can repel pests like the horn worm, and for cabbage it can fend off cabbage moths. Chamomile – This can have numerous beneficial effects when planted with any brassica, onion and cucumber, helping to attract the right insects that are beneficial to the plants' prosperity. Dill – Dill can be planted with numerous plants, including lettuce, cabbage, and cucumber. It helps to repel unwanted pests, as well as improve flavor. Catnip – When planted near cucumbers or squash, catnip can work to repel squash pests and aphids. Radishes, when planted near cucumbers, can help to ward off cucumber beetles. Marigolds can be planted throughout your garden and are beneficial in repelling pests and nematodes. Nasturtiums can be highly beneficial when planted near plants such as tomatoes, cabbage, and cucumber, nasturtiums. Onions can work well when planted near plants such as cabbage, tomatoes, peppers, broccoli, cucumbers, and peppers. Companion planting these plants together can help significantly when learning how to keep bugs out of garden. Sunflowers not only look lovely when they are grown, they can also work as wonderful trap crop for pests such as aphids. In companion planting, they're typically planted near vining plants such as beans and cucumbers, providing them with a trellis with which to grow up. Server responsed at: 04/22/2019 2:28 p.m.